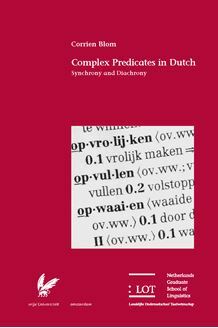 This study presents an analysis of the synchronic and diachronic properties of two types of complex predicate in Dutch: separable complex verbs (or particle verbs) and inseparable complex verbs (or prefixed verbs). The synchronic part of the book discusses the morphosyntactic structure of these complex predicates and their semantic properties. The diachronic part focuses on the grammaticalisation of the two types of complex predicate. The data are drawn from a Modern Dutch dictionary and a Middle Dutch corpus. The data are interpreted in a “linking” model of the language faculty, which posits parallel, autonomous but corresponding levels of representation. Such a model separates the semantic structure of complex predicates from their morphosyntactic structure. The notion “constructional idiom” also plays an important role in accounting for the data and the analysis thus sheds light on the relationship between syntax, morphology, and the lexicon. Complex Predicates in Dutch is of interest to linguists studying complex predicates, the syntax-morphology interface, the semantics-syntax interface, constructional idioms, grammaticalisation, and Germanic languages.